It doesn’t take me long to list my favorite indie games: Braid, Journey, Faster Than Light, Hotline Miami, and, of course, Supergiant Games’ Bastion. Like the other games I mentioned, Bastion is unique, but all of them share a few common elements. Each game is beautiful and visually distinct, buoyed by an incredible soundtrack that begs to be played outside of the game itself, and features great gameplay, and strong storytelling, even if the story being told is a relatively simple one. Of all of these games, Bastion is the one that is the most reliant on its production values to sell itself. It’s the only one with extensive voice work and vocalized tracks, the only one with completely hand drawn artwork, and the only one with a complex script. It has excellent gameplay, to be sure, but it relies on the whole package to achieve its (fairly ambitious) goals. You don’t come to Bastion for just the gameplay. You may start out that way, but it’s probably not the thing you’ll look back on the most fondly once the credits roll. 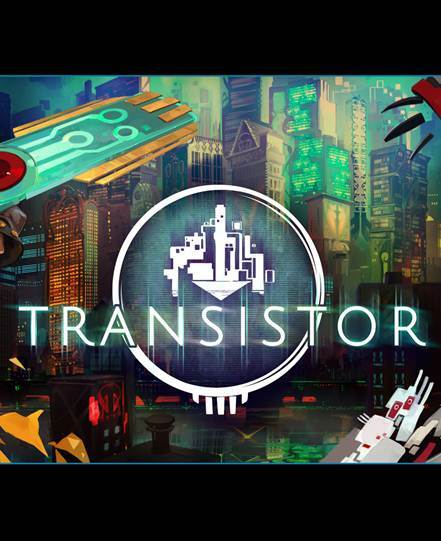 When Transistor was announced, it looked an awful lot like Bastion. The art was beautiful, but similar. The gameplay was still that of an isometric action RPG. There was an incredible musical score, and quite a bit of focus on a narrator character voiced by Logan Cunningham. And in a lot of ways, Transistor does feel like a direct follow-up to Bastion, if not a spiritual successor, just because its various elements are so similar. "Transistor opens with the main character, Red, a famous singer in the futuristic city of Cloudbank, pulling a large, glowing sword that was meant for her – the titular Transistor, a weapon that absorbs the souls of the dead and converts their personalities into abilities that reflect who they were in life – out of a man’s chest." However, writing Transistor off as a “been there, done that” game would be wrong. This is one of the rare titles that manages to feel familiar and yet distinct at the same time. Like Bastion, the game begins in medias res, just after an event that shatters the life of the player character. Bastion began with the Kid waking up to find the world around him destroyed by the Calamity. 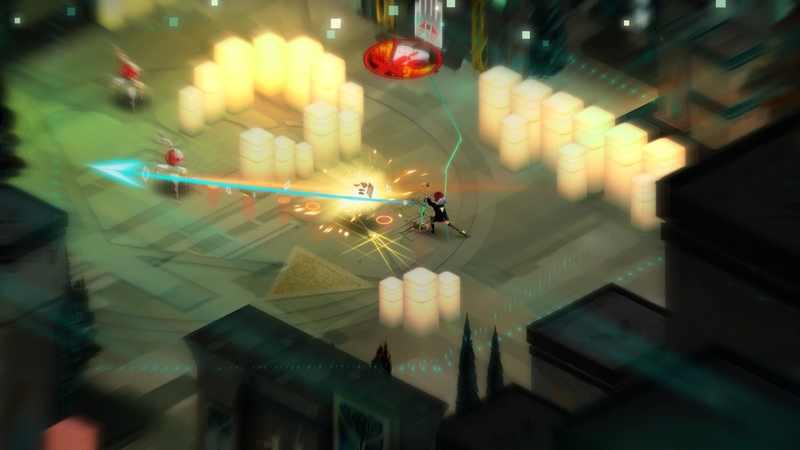 Transistor opens with the main character, Red, a famous singer in the futuristic city of Cloudbank, pulling a large, glowing sword that was meant for her – the titular Transistor, a weapon that absorbs the souls of the dead and converts their personalities into abilities that reflect who they were in life – out of a man’s chest. And then, just as you start moving, the sword starts talking. This isn’t quite like Bastion’s narrator, however, because the sword isn’t talking about you; it’s talking to you, and talking to you rather intimately. Unfortunately, Red can’t respond – she’s lost her voice, you see – but the two soon set off to find out why someone wants Red dead. Before long, it becomes obvious that something is seriously wrong in the city. The streets are abandoned, and a group of mechanical entities known as The Process are consuming anyone and anything in their path until there’s nothing left. Who or what is behind this is unclear, and you probably won’t have a good idea of what is actually going on beyond the immediate moment until the end, simply because Transistor doesn’t offer any easy answers, and in reality, it doesn’t have to. The stakes are big, and the plot is complex, but Transistor deals with those things quietly, often in the background. 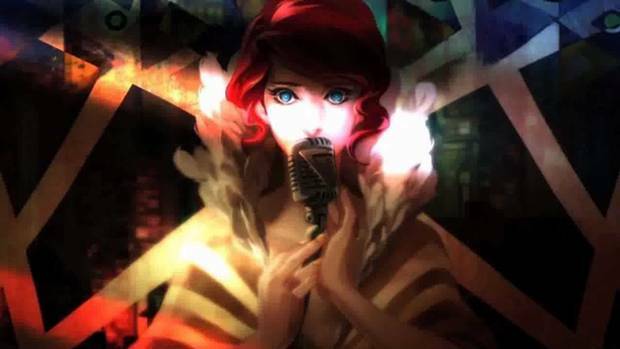 The story is really about the relationship between Red and the soul within the Transistor, and the dialogue is more conversational than expository as a result. It is a conversation that the Transistor has to maintain all on its own, as Red can only communicate by typing messages on the various terminals scattered throughout the environment. "Abilities can be used in three ways: as a basic ability, as a supplement to a basic ability, or as a passive ability that provides a permanent buff as long as it is equipped." Because of this, most of the game’s plot is delivered through text, in the form of the reports that the Transistor has on the various souls inside of it. These files are instrumental to understanding the depth and scope of the game’s narrative, and the ability to unlock more information is always in the player’s control. Each character file is directly related to the specific power that character provides, and the file can be expanded by using that ability in specific ways. 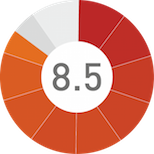 Abilities can be used in three ways: as a basic ability, as a supplement to a basic ability, or as a passive ability that provides a permanent buff as long as it is equipped. You can rearrange your abilities at any of the access points scattered all over Cloudbank, and the game actively encourages you to do it as you’ll have to use an ability in each slot (active, supplementary, and passive) to unlock all of the information on the character behind it. The number of unique combinations is impressive, and after a few levels, you’ll have far more than you can equip at any one time. It’s all a little overwhelming at first, but the game manages it by limiting your customization options. Only four abilities can be active at any given time, and each can only be modified by two supplementary abilities, though you’ll start out with just one supplementary slot for each, and there are only four passive slots, though you’ll only initially have one. In addition, abilities take up a certain amount of system memory, so you’ll have to mix and match if you hope to get the best combinations and completely unlock your files. "Red can enter a state called Turn(), which allows you to stop time, move, and queue up commands which are then executed instantly. Moving and using abilities take up a set part of the gauge, which means you’ll have to pick your shots if you get the most of each Turn(), especially since you’re all but unable to use your abilities for a few seconds while the gauge recharges." This level of customization gives you an almost unheard of amount in freedom in combat. The skills you’ll acquire range from direct damage and area of effect abilities to debuffs, dashes, and the ability to cloak, and how you combine them, and use them in concert with one another, matters. Cull(), a rising sword strike, does an impressive amount of damage, but it does even more when after using Mask(), which cloaks you from enemies, and hitting them with Crash(), which debuffs your enemies. Toss something like Void() into a passive slot for its 125% damage increase, and you’ll kill literally every enemy in the game in one shot. Alternatively, you could equip Switch(), which turns enemies against their allies, and Help(), which spawns a helpful minion, and have your pets do all the work for you as you snipe from long range with the incredibly damaging Breach(). Transistor works very well in real time no matter how you play it, but the game is really designed to be turn-based. Red can enter a state called Turn(), which allows you to stop time, move, and queue up commands which are then executed instantly. Moving and using abilities take up a set part of the gauge, which means you’ll have to pick your shots if you get the most of each Turn(), especially since you’re all but unable to use your abilities for a few seconds while the gauge recharges. Of course, you can add time to your Turn() gauge with the right combinations, and even retain the use of some of your abilities, too. It all depends on how you play. 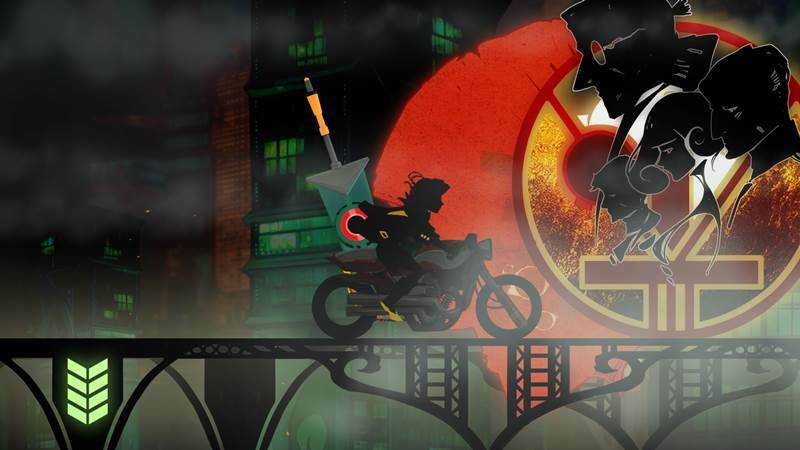 "It’s the details that sell this game: the way that Red drags the sword on the ground because of it’s too big for her to carry properly, the way the Transistor flickers when it talks, the little touches in the environment." It’s that freedom that will keep you entertained despite the fact that you won’t always know what’s going on. Well, that and the excellent art design, voice acting and music. It’s the details that sell this game: the way that Red drags the sword on the ground because of it’s too big for her to carry properly, the way the Transistor flickers when it talks, the little touches in the environment. It’s an absolutely gorgeous game from beginning to end, and that carries over to the music and voice acting as well. Once again, Darren Korb has crafted an absolutely phenomenal soundtrack that, like its predecessor, will go down as one of the year’s best, and Ashley Barrett also returns to add some lovely vocals to what are the game’s best songs. The voice acting is just as good. Logan Cunningham is still the most impressive member of the game’s cast, and proves his impressive vocal range, but everyone does a great job with the material they’re given, nearly all of which is good. 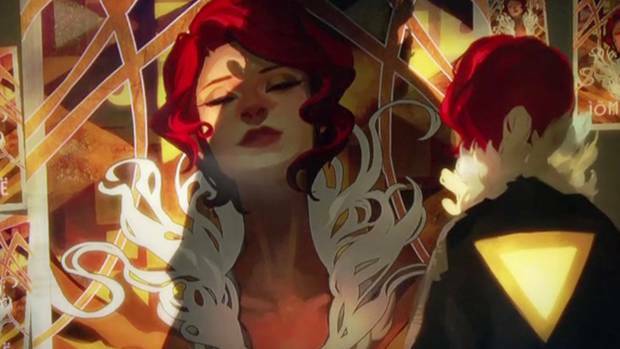 Still, for all its successes, Transistor isn’t a perfect game. Optional challenges return, but they don’t feel as necessary since you’re getting experience and not weapon upgrades, and it’s easy to skip over them without losing anything. They’re fun little diversions when you understand the skills that have been pre-selected for you, but sometimes the game shackles you with a skill you’ve never used before and don’t understand. One challenge forced me to use the Get() skill, which I never managed to unlock, and try as I might, I could never quite figure out how it worked, and so was unable to complete the challenge, though I did come frustratingly close a few times. "It is a game that excels in nearly everything it attempts, and manages to feel unique despite its obvious heritage. It’s kind the kind of game that’s easy to love, the kind that will make you think of new combat strategies during your commute, or have you humming the soundtrack in the shower." The game’s linearity also means that the pacing sometimes becomes a concern. Bastion’s, well, Bastion alleviated this problem by allowing you to return to and play around in a safe area after every mission. 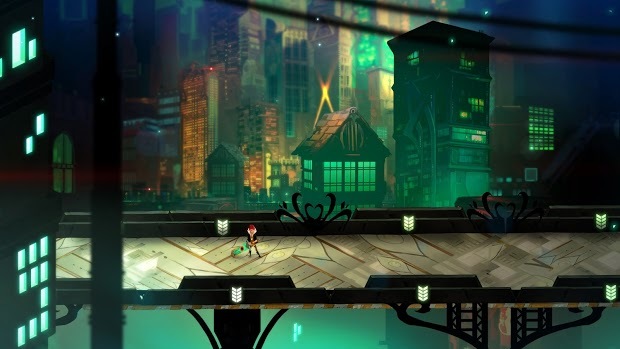 Transistor tries to do something similar with a beach area that Red can visit, but it doesn’t work as well, mostly because it can only be accessed at certain points and just doesn’t have as much to do as the Bastion did. As a result, you’re occasionally just herded from combat encounter to combat encounter. While this is rare, it does make certain parts of the game feel like a chore. In the end, however, these are minor complaints, and they do little to impact Transistor’s overall quality. It is a game that excels in nearly everything it attempts, and manages to feel unique despite its obvious heritage. It’s kind the kind of game that’s easy to love, the kind that will make you think of new combat strategies during your commute, or have you humming the soundtrack in the shower. For all of its accomplishments, however, it’s still the story of a mute singer and her talking sword, a story about power and loss and love and shadow organizations and master plans gone horribly awry. Transistor never offers easy answers, and it expects you to come to the conclusions yourself. You may get lost along the way, but it’s the good kind of lost, and you’ll think about it even when you’ve put it down for the night. It’s that kind of game: the kind of game that sticks with you long after the credits roll, the kind that, like Red, understands the power of a single word. Deep, diverse combat system that encourages experimentation. Incredible art design. Fantastic writing and strong storytelling. One of the year’s best soundtracks. Wonderful voice acting really sells the characters. Lots of replay value. The game’s story and gameplay initially feel overwhelming. Occasionally poor pacing. Challenges don’t feel as natural or as important as in Bastion. Transistor is a fantastic follow-up to Bastion that features incredible art design, wonderful music, deep, customizable, strong storytelling and one of the best plots in recent memory. It’s a thoughtful, beautiful, and well-designed game that should be played by everyone with a passing interest in RPGs. Go buy it. Now.